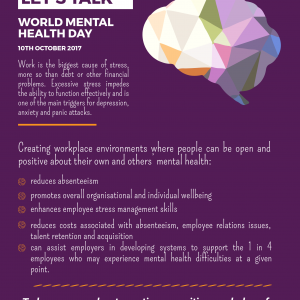 Creating an open culture that highlights the importance of mental health and supports employees who are experiencing wellbeing issues is imperative, not only for the individual but for the workplace as a whole. Management should be fully equipped, trained and confident in dealing with matters of mental health, helping employees identify the triggers at work and developing a plan of action to help them deal with them. Stigma around mental health issues is still a big problem in society at large and this tends to make people reluctant to talk about it or seek treatment. At work, Management tend to have an old-school train of thought towards mental health, “I’m paying you to do a job, just get on with it and stop moaning”, as they try juggle the pressures of ‘the bottom line’. It’s time to re-educate ourselves of the impacts that mental health has on our ‘bottom line’. when working long hours more than a quarter of employees feel depressed (27%), one third feel anxious (34%), and more than half feel irritable (58%). the more hours you spend at work, the more hours outside of work you are likely to spend thinking or worrying about it. as a person’s weekly hours increase, so do their feelings of unhappiness. many more women report unhappiness than men (42% of women compared with 29% of men), which is probably a consequence of competing life roles and more pressure to ‘juggle’. nearly two thirds of employees have experienced a negative effect on their personal life, including lack of personal development, physical and mental health problems, and poor relationships and poor home life. 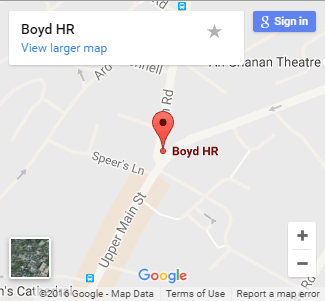 Boyd HR deliver mental wellness programmes and implement policies and procedures to promote wellness at work. Many companies in Ireland have no wellness policy even though we acknowledge that dealing with stress and mental health at work are priorities. The larger companies tend to have some form of wellness programmes (as they can afford them) but within the SME sector there’s very little. We in Boyd HR train managers to recognise that someone is in trouble, we help them develop skills to identify and deal with the issues, giving support not advice. Well-meaning managers may offer people “a few days off” but in some cases that’s the worst thing to do, as people really need the structure of the working day. Without it they may go even further into themselves. People think depression, in particular, is entirely mood-related but it is far more wide-reaching, with impacts on cognition and concentration. There is still a massive job to be done around mental health education. For more information on Boyd HR can help you co-create a strong workplace please contact any member of our team on 0749123150.